This rubber stamp set contains 12 images of flowers, leaves and butterflies. Some images have intricate doodled designs reminiscent of Zentangle, while others are more open leaving you free to fill with your own doodles or colour. The stylised leaves can be used as petals to make up flowers or even used as a butterfly body with stamens or wire glued to the back for antennae. I have wanted this stamp set for so long. I just love it and have found so many wonderful ways to use it. Beautiful detail on these stamps. So much larger than expected making them wonderful to use on so many different types of projects. First class service from Chocolate Baroque as always. Lovely large stamps. Very detailed stamps and versatile. Usual high quality stamps from Chocolate Baroque. These stamps are so versatile and the large size makes them just great to use in so many designs. I have used them so much and highly recommend to anyone thinking of buying them to do so. Popular stamp, due to sample shown. This was a replacement order. These images are large and wonderful!! They stamp beauitfully!!! A simply stunning set! The butterflies are beautiful - and BIG! They look fabulous mounted with foam pads over a subtle background with a simple sentiment. They really don't need any more than that to show them off. Ditto the flowers, although the varied leaves will set them off nicely too. 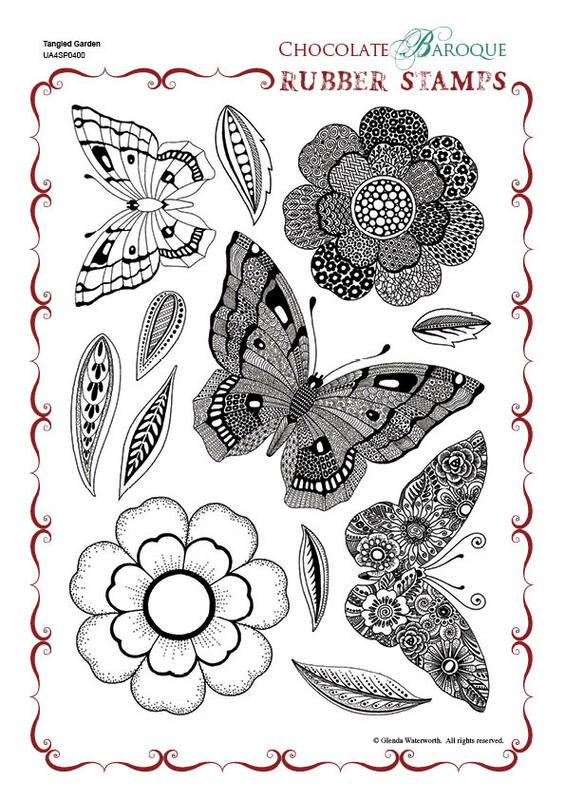 The plainer butterfly and flower would lend themselves to some Zentangling, if one was so inclined, or paper piecing, and the whole set is perfect for anyone who loves colouring in.